PC madness dominates the Western World. Vocabulary gets changed, 130 year old literary books get banned or rewritten. Soon bananas will be outlawed, for being offensive to Negroes Blacks African Americans. Blacks, women, and other minorities are considered fragile oversensitive beings that can not bear hearing a joke or other offensive language or pictures. Any potential offense to their feelings must be removed from the face of the earth. So much that even research about race and iq, or publication of US department of justice crime statistics is politically incorrect. Newspapers do their best to hide the race of Black criminals, especially when it is flash mobs beating up Whites and Asians. Few countries have escaped political correctness. "Freedom of speech is freedom of speech! Deal with your hang-ups yourself," she wrote on Twitter, saying the post had boosted her rating. She sure has a point. But freedom of speech that slightly offends disadvantaged minorities has serious consequences in the Western PC (politically correct) world. True. Another example of ridiculous oversensitivity are harassment laws in the US. Minorities are considered so immature and oversensitive. "Sticks and Stones may hurt my bones, but words will never hurt me" seems beyond their capacity. Others inside Russia and across the world were critical of the picture. Tikhon Zyadko, a journalist, responded on Twitter that: "Duma deputy Irina Rodnina doesn’t hide she is a racist". "Maybe this is everyday racism. Maybe it’s that she was badly brought up and has a warped sense of humour," wrote the deputy editor of the Moskovsky Komsomolets newspaper, Aider Muzhdabayev in a blog. "The main thing is that Rodnina did this, and she doesn’t regret it a bit." 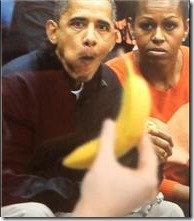 I have a problem with the photo: Obama appears to be chewing it, but the banana has not even been peeled!